This is a continuation from this entry. We have been cleared hot. 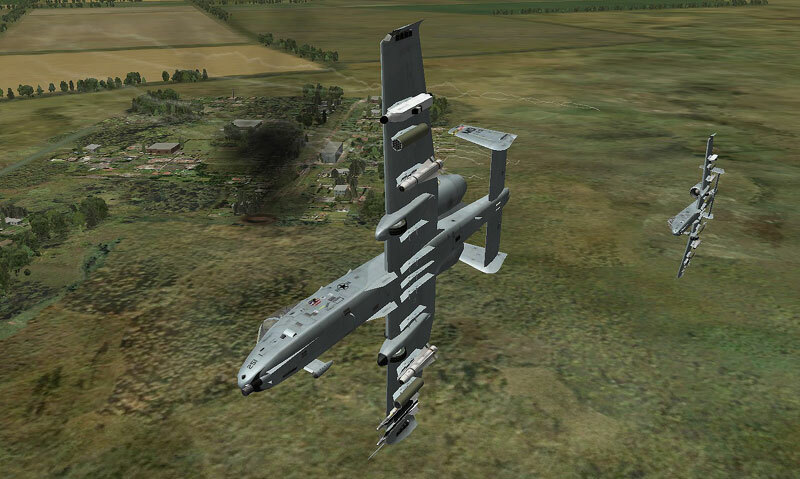 This time the JTAC gave us free reign on what ordnance to use, but it is common practice in Type 1 CAS for the JTAC to choose which type of weapon the attack aircraft should use. I haven't mentioned yet, but there is an SA-11 some 20 km from our target. By the way, I don't know what happened since the latest patch, but the SA-11 is not giving us such a hard time. We keep it real, though, and try to fly low as much as we can. 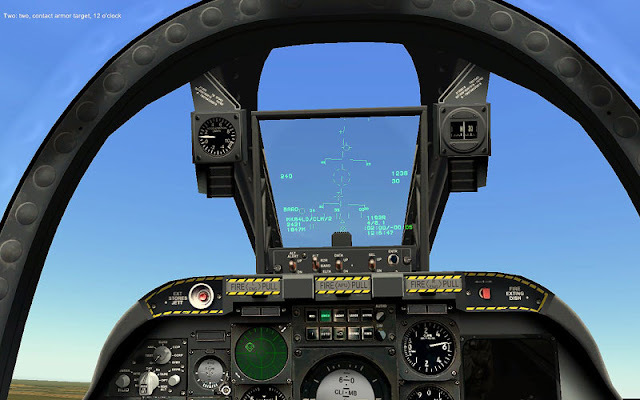 For our attack run, I used (more or less) the tactics explained by SimHQ's Andy Bush (former A-10 pilot) in this excellent article. We approach low and at the pull up point climb for the final bomb run. 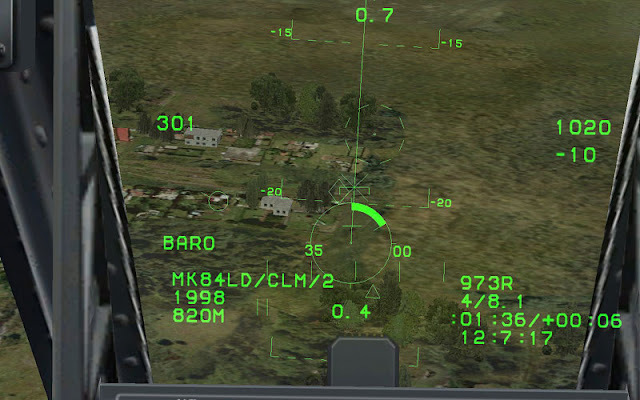 Attention: during the pull up don't let your airspeed to go below 240 knots! In this case, we could only climb to 1,200 ft. My wingman is reporting enemy armor. Just super. Note the RWR; an SA-11 is tracking us. There is not much diving when you come in from 1,200 ft, so our bomb run goes on from a shallow -20 degrees dive. 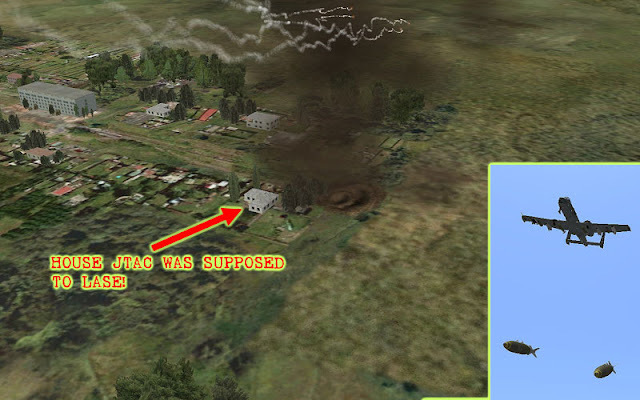 The target mentioned by the JTAC is the house below the left -20 degree mark in the HUD, but his laser appears to be pointing at a bunch of trees nearby. The JTAC reports bombs on target, but the house is still standing. As specified by the JTAC, we exit east towards the CP. 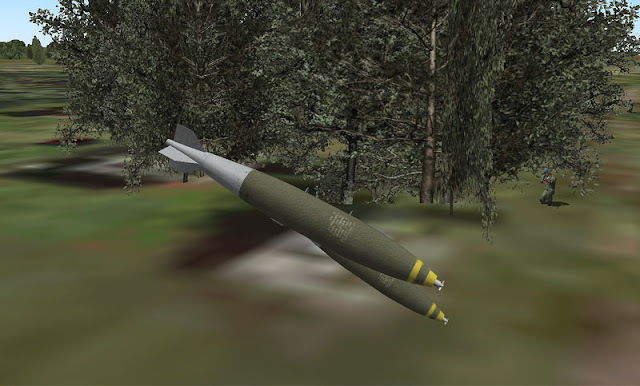 As in real life, from the air we couldn't really figure out if our bombing run was effective or not. We have been tasked with bombing infantry; they are almost invisible from the air. We have to rely in our JTAC for that ... and he bugged out from his position. What's going on down there? A recording of the mission allows to see all those things we missed because we were busy flying, bombing and staying alive. Below is a sneak peak of what was going on below our wings. There was enemy infantry around that house. The JTAC may have moved his laser a bit from it ... whatever ... the bombs fell close enough to the enemy position. During the debriefing, I was informed that our bomb run killed 8 enemy infantry. Our infantry was relatively close to our target. They started pulling out to the south as soon as we were cleared hot. A smoke column and two aircraft in the far background can be barely seen. That's us. These infantrymen better hurry up across the river. Enemy armor is approaching the town! Heey, I see you are very interested in flight simulations and taking it seriously. Are you a member of a virtual squadron? I have started a new unit, 17th Virtual Fighter Wing flyng the Su-27 Flanker and homebase at Krymsk. If you´re interested ad my MSN (91-an@live.se) The simulation is of course LOMAC:FC 2.0 greetings from Sweden. Unfortunately my gaming time in general is very little. Maybe sometime in the future when my work eases a bit.